Monitors have been a very important part of my photographic career for more than a quarter of a century. At the beginning of digital editing, monitors were CRTs with picture tubes. There was no color calibration. Color management was a roll of the dice at best. They ranged in price from $1,500 for a SuperMac screen to over $6,000 for the Barco version. I switched from CRT to LCD screens when Apple introduced the 17″ Studio display in 2001. I added a 20″ Apple Cinema display and then a pair of their 23″ versions. Finally, in 2013, I bought a pair of 27″ Apple Thunderbolt displays to go with a MacPro coffee can computer. Then Apple chose to no longer make monitors. I received an Asus ProArt PA32UC HDR 32″ monitor to keep in exchange for writing this review. Imagine my trepidation in finally stepping away from trusted Apple monitors into a brand-new unknown unit. I installed it as my main monitor between the two 27″ Thunderbolt displays. It’s big. It’s much larger than the 27″ displays. Surprisingly it’s only 1.5 pounds heavier. It weighs in at a svelte 25.13 pounds. It’s thin — super thin. From the front of the nearly frameless screen to the back of the case, it’s less than two and three-quarters of an inch thin. Big doesn’t stop with physical size. The 32″ flicker free screen sports a resolution of 3,840 pixels by 2,160 pixels. Compare that to the Apple 27″ at 2,560 pixels by 1,440 pixels. While it doesn’t seem like it’s all that much, the Asus 32″ allows three full-size webpages to be displayed side-by-side. This is a webmaster’s dream. It is easily a great monitor for Photoshop. There is enough room for the photograph and the numerous panels to show on the same screen. Color reproduction area for the Asus PA32UC HDR monitor. Color has come a long way since the early days of digital and CRTs. The Asus PA32UC HDR monitor covers 100% of sRGB, 99.5% of Adobe (1998) RGB, 85% of Rec. 2020 and over 95% for DCI-P3, the color gamut of iPad Pros, MacBook Pro laptops with wide gamut Retina displays, Samsung Galaxy 8, Google Pixel 3 and Pixel 3XL. DCI-P3 has a 25% larger gamut than sRGB. 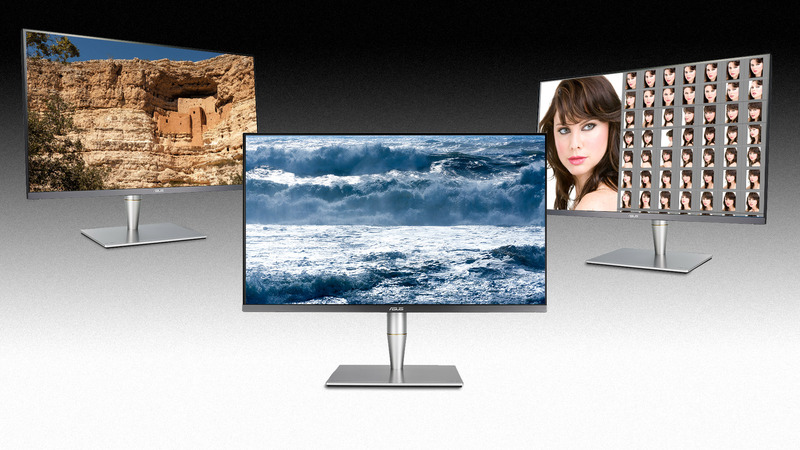 This Asus monitor has picture-in-picture capability as well as picture-by-picture for up to four UHD windows. For security, a Kensington lock is provided. The monitor may be used on the desktop with the supplied stand, with a wall mount using VESA. Two 3-watt stereo speakers are built in. Here is a link to the full spec sheet. Power and input/output cables plug into the Asus 32″ at the bottom in the back of the screen behind the mount. Here is my new arrangement of screens. The Asus 32″ is in the center. It’s flanked by the two Apple Thunderbolt 27″ displays. My photography post-production suite with the Asus PA32UC front and center. I am working on a Mac Pro (Late 2013) with two AMD FirePro D700 graphics cards. I believe in getting the most powerful graphics cards. This paid off. For this setup, the Asus is connected via HDMI. Thunderbolt 3 with an Apple Tbolt 3 to Tbolt 2 adapter is another option for this computer. While my Mac Pro is too old to have Thunderbolt 3, the Asus 32″ is ready to go if and when Apple releases a new version of it’s a professional desktop computer. That’s comforting. I am a stickler for looking straight into the center of my displays. Every display I have ever used is too low for hours of comfortable work. I use glass bricks to lift them to the right height. The Asus stand raises up and down to easily align its display area with the Thunderbolt screens. Nice! It’s still big. The screen is evenly lit edge-to-edge to my eye. the photo above shows a little vignetting. It is not noticeable at all in real life. The screen is a non-glare matte finish. Hallelujah! My personal bias opposes the reflective glass screens that Apple now forces on its customers. When I built my new studio, the reflectivity of these glossy glass screens was a major consideration. The wall the monitors face is painted matte black. The detail on the Asus PA32UC is incredible. The true resolution is 3,840 pixels by 2160 pixels. I now sit a lot closer to this screen to be able to read the type. Even though it is small, it is sharp and very easy to read. I can work on multiple screens of information all on the Asus. Before, I was able to show only one screen of info per display. This worked well, but now I am much more productive. Photoshop shows immaculate detail with only the photograph at 100% pixel magnification is shown on the Asus 32″ screen and the palettes and panels open on the right display. Bridge shows the original camera files on the left-hand monitor. I use X-Rite tools to calibrate my monitors. The Asus PA32UC HDR monitor is easy to calibrate. It appears to have more neutral grays than do the Apple displays. To be fair, the Apple units are six years old. Since I use them for non-color critical functions so I am not concerned with their color. The Asus is a whole other story. I depend on its ability to show me everything that the sRGB colorspace has to offer. This gem of a monitor shows me 100% of the sRGB colorspace. I know with certainty that the color I deliver to my clients will reproduce accurately on the internet or on the printing press. The 5-way stick is at the top of the buttons. One of the calibration considerations is the ability to control a monitor’s brightness. Most screens are way too bright. The photos you see of my screens are with the monitor brightness set to 120 nits or 120 cd/m2 (candelas per square meter). Most high-end monitors can deliver 350 nits. Brighter is not necessarily better. Changing the brightness or any of the other adjustments is easy. Select the adjustment you want to make by pressing the corresponding button on the lower left back panel. Each choice shows on the screen (OSD). Use the 5-way stick to change values. Alternatively, everything can be accessed by using the 5-way stick. Press it in to go to the menu. Nothing in life or digital photography is perfect. I have a couple of issues with the monitor. Both of them are nit-picky. The first is when the screens are put to sleep using a hot corner. The two Apple displays go black instantly. The Asus goes to a screen the color of the blue-screen-of-death with the Asus logo in white against a black box with a white frame. I don’t need or want a reminder of the monitor’s maker. If I can’t remember, “ASUS” is embossed in the center of the bottom bezel as is the Apple logo on the other screens. Just go to sleep, please. Don’t fuss. When waking up, the Asus has to again show its logo. Not important and visually unfortunate. Upon waking the workspace is scrambled on the Asus monitor. My biggest peeve is when I return to Photoshop after working in another application. For some unfathomable reason, the workspace gets scrambled and the document frame repositions itself. This happens when I leave Photoshop for a period of time and after the screens come back to life after being sent to sleep. It’s easy to fix — Window > Workspace > Rest Kevin’s Workspace then click the green button in the upper left of Photoshop’s document frame. It is slightly annoying. Those are my nitpicks. None of them are a big deal or reason not to get this gem of a display. The Asus ProArt PA32UC HDR 32″ monitor provides a lot of space for anyone who works with multiple applications or Web pages at the same time. There is a lot of screen space to arrange things to work efficiently. It is easy to color calibrate. It shows 100% of the sRGB colorspace. This is significant for anyone creating for publication on websites, for making high-quality inkjet prints or for running on a sheet-fed printing press. At $1,999 it is near the top of monitors with similar specifications. Is it worth the price? Yes, it is. Each of my 27″ Thunderbolt Apple displays cost $1,000. This is a good and so far reliable screen that is now the center of my digital imaging life.